Ms. Marvel meets the Avengers during a mission to rescue Namorita from Tiger Shark. The mutant shape-shifter Raven Darkholme (Mystique) surfaces, and schemes against Ms. Marvel. When Ronan and the Supremor (Kree Supreme Intelligence) attempt to take control of Ms. Marvel, Captain Marvel comes to her aid. The Avengers and the Guardians of the Galaxy (with aid from Nighthawk, Ms. Marvel, Captain Marvel, Moondragon and other Avengers from the past) face the being known as Michael (also called "the Enemy", and formerly Korvac the Machine Man). (Ultron and Tyrak also attack, but are quickly dispatched.) The Elder being called the Collector is killed by Michael, but despite this, his daughter Carina falls in love with him. Eventually, the Avengers and Guardians are severely defeated, but Michael surrenders when he loses the support of his lover. After the Fantastic Four break up (due to Reed losing his stretching powers), Reed is unknowingly hired by a clone "son" of Dr. Doom. After the clone is killed, Doom and Reed Richards engage in battle one-on-one, after which underground leader Zorba takes leadership of Latveria and the FF reunite as a team. The Hulk encounters the criminal psychologist Karla Sofen (previously associated with Dr. Faustus, but now the new Moonstone). Captain America encounters the SHIELD superhero Marvel Man (later Quasar), who wields the original Marvel Boy's Quantum Bands. The Falcon parts with Cap to lead the new SHIELD super team. (Also, by this time the enhanced strength Steve gained in 1973 has faded out). Steve Rogers recovers memories of an encounter just before he fell into suspended animation in 1945, as well as (false) memories of his life before becoming a super-soldier. Iron Man, Jack of Hearts and the Soviet Super Soldiers (Vanguard, Darkstar and Crimson Dynamo) are caught in a conflict between renegade Rigellian Colonizers and the Knights of Wundagore II. Madame Masque betrays Tony Stark to save the life of her father, Count Nefaria. 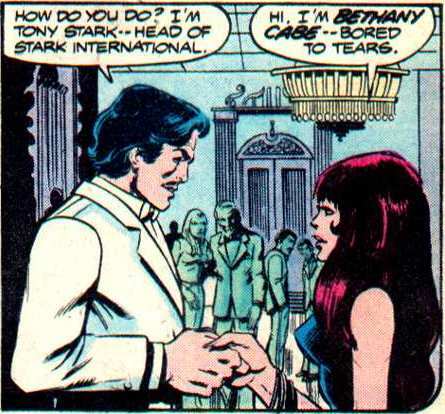 Tony Stark meets Bethany Cabe, a new romantic interest (and secretly, professional bodyguard). James MacDonald Hudson, Weapon Alpha (later Guardian) attempts to bring Wolverine back to Canada. Daredevil encounters the devil-may-care mercenary Paladin. Matt Murdock hires Becky Blake as his new secretary, while Daily Bugle reporter Ben Urich begins following DD's career. When Valkyrie's college friend Dollar Bill airs his "documentary" about the Defenders, dozens of heroes (and villains) suddenly declare themselves a member. Patsy Walker (Hellcat) has a reunion with her old friend Millie the Model. Valkyrie, Hellcat, Nighthawk and the Hulk go to Valhalla and fight on Hela's behalf. Harokin becomes ruler of Valhalla. Captain Marvel fights a Thanos-programmed ISAAC (Titan's world-computer), and falls in love with the conspirator Elysius. Ben Grimm is assisting the energy research center Project Pegasus when the Cosmic Cube is stolen and used to create Jude the Entropic Man. Dr. Strange and Clea face the machinations of the Dweller in Darkness. After Dracula helps Topaz battle Mephisto, the demon transforms him into a human. John Jameson, the Man-Wolf, visits the "Other Realm" dimension and learns of his incarnation as Stargod. Spider-Man meets Captain Britain when Brian Braddock attends ESU as an exchange student and together they battle toy-oriented villain Arcade. Spider-Man and the Man-Thing save Dakimh the Enchanter and Jennifer Kale from D'Spayre. Spider-Man, Ms. Marvel and Dr. Strange are aided by the New Orleans witch-queen Marie Laveau when Clea is kidnapped by Silver Dagger. In the process, Strange is cursed with lycanthropy and becomes a werewolf. Satana appears and sacrifices her life to cure Strange. Peter Parker learns of the Champions' break up when he runs into the Angel. Peter Parker graduates from college. Odin sacrifices his eye to Mimir for clues to a way to prevent Ragnarok. Sigyn (Loki's wife) and Frigga (Odin's wife) return to Asgard (from guarding the 12 Young Gods against the Celestials' return). Balder dies from machinations set in place by Loki. Thor inadvertently brings Roger “Red” Norvell to Asgard, who becomes a "new" Thor. Eventually Odin saves Asgard by secretly manipulating events into a "false" Ragnarok, with Norvell perishing in Thor's place. 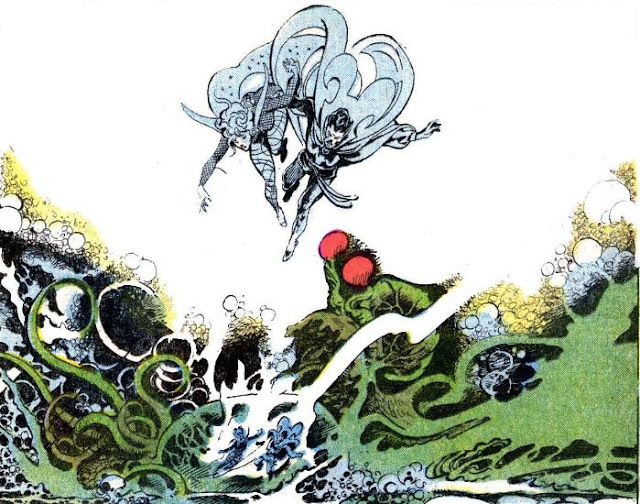 Thor recovers memories of his long-ago encounter with the Eternals during the Third Host of Celestials. Devil Dinosaur and Moonboy become partners in a prehistoric land (possibly on an alternate universe Earth). The planet of Devil and Moonboy is visited by mysterious extraterrestrials. Later, Devil falls into a timewarp and visits the year 1978. Godzilla battles the giant robot, Red Ronin. Dum Dum Dugan uses Pym Particles to shrink Godzilla to manageable size. Ulysses Bloodstone dies after destroying the Hellfire Helix. Shanna the She-Devil finally catches her arch-enemy Raga-Shah. Morgan le Fay surfaces in modern times, seeking the Darkhold from Spider-Woman and her mentor Magnus.